Most photobooths are cramped and cumbersome, with a cheap camera on a timer that ultimately produces a strip of itsy-bitsy pictures. Within a few months, the photos are tossed or lost and most guests vaguely remember cramming into the photobooth at all. 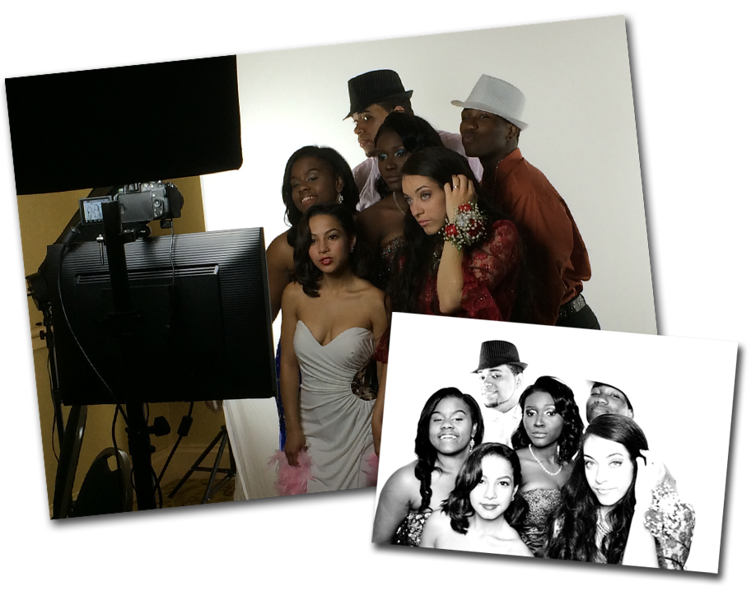 At MINT Photobooth, we deliver portrait-quality photographs using professional-grade equipment that includes a dSLR camera, studio lighting, and an 8 by 10 foot backdrop that provides plenty of room for group shots, fun poses, and spontaneity. Your guests have spent time and money to look their best for your event - why take their picture with a glorified webcam? With MINT Photobooth, guests control when the camera captures the moment - and it's hard to resist snapping away with the combination of supermodel lighting and self-directed shooting! Best of all, there is no printed photo strip of average-quality pictures. That means no limit on how many photos you take and no photos to get lost in the seat cushions on the way home. Instead, your portrait-quality photographs are available within minutes on our website, enabling you and your guests to download, share, and post them as you wish. Our photos are high-quality and can be printed on your home photo printer or at your favorite photo developing service. With everything at your fingertips online, your memories - and your photographs - can truly celebrate the moment. * online access is dependent on internet availability. MINTphotobooth uses a mobile hotspot to connect to the internet, but if an internet connection cannot be established from your event's location, photos will be uploaded as soon as a connection can be secured.